I thought I’d write up the process by which I connected up my Current Cost meter to my computer so that I can see my electricity usage data on a timeline and share the data with others. It’s a bit of dummies guide pulled together from the many websites that discuss Current Cost but have a tendency to use words like Linux; you know, words that I and 99% of other computer users simply don’t understand. I’m going on the basis that you have got your Current Cost device working okay. These are instructions for connecting to a PC. I tried plugging the meter into a mac but hadn’t a clue what to do next when the mac didn’t recognise the device (advice welcome thanks). Step One: The Current Cost meter needs a special lead to connect it to the computer’s USB port. You can buy that lead from ebay. It connects to the port on the bottom of the meter. Step Two: You plug in the USB into your computer and your computer gets confused. Mine thinks it’s loading a mouse or sometimes just gives up. But it doesn’t matter. If you look under control panel (click classic view) choose device manager and then Ports (COM & LPT). You’ll now know which serial port your device is connected to (it’ll say Serial to USB COM7 or whichever number it gets assigned to). Make a note of the number it is on. You may need to do this step each time connect the device although mine is always on either COM7 or COM8 so I just guess rather than repeat the above steps. 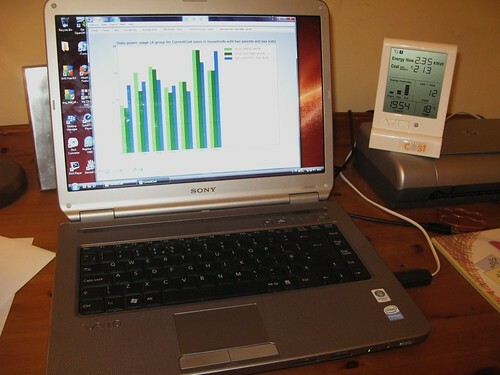 Step Three: Get some software to read the data from your meter. Dale Lane has created two useful bits of software. One reads the data, creates graphs, summarises trends and can share your data with other users (the instructions tell you how). The other (link is to executable file) just creates a series of graphs on one page, this one’s probably simpler to use to be honest if you want an at-a-glance look at how you’re doing. However, sharing data is what excites me about Current Cost – I’ll talk about thoughts on that in another post. Step Four: Take a look at that data. To get the data through, both sets of software ask you to input the COM port number. Once you do that the data comes through. The meter itself saves a day’s worth of two-hourly figures, single day data for the last 31 days, monthly data for 12 months and yearly data for four years (info from Dale). 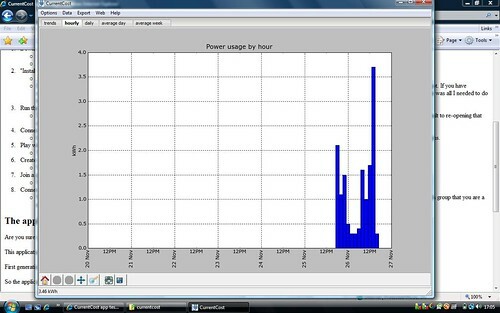 The software saves the data as well so as long as you connect the meter and ask for data (it doesn’t happen automatically) at least once a day you will have complete two-hourly figures for each day from the point you started recording. Overall the software is really useful. We now know that we use most energy between 3pm and 5pm. Why, I haven’t a clue. That’s the time just after child no. 1 comes back from school; is she going round switching on every single appliance? The likely culprit is actually weekend clothes washing/drying. That’s backed up by the double peak we see on Saturdays and Sundays. Next step I want to tackle is getting the meter to speak to the outside world on its own. I intend to get it to tweet – given my technical naivety that may take some time. This entry was posted in Act on CO2, technical and tagged Act on CO2, currentcost, meter, software. Bookmark the permalink. How is the twittering coming along? I would love to try that too. The one linked from currentcost I could not get to work on my MacMini Intel osx 10.5.7.